This event is now in its 2nd year and the idea behind it is to raise both funds & awareness for all local charities and for the whole community from the young to the elderly and families. There are more and more groups, clubs and established organisations who need your help in maintaining their roles in the ever expanding voluntary sector. These groups, all locally based, will both be at the event to raise funds directly and / or may benefit from any surplus generated from this event. We need the community to support this event on the day, but we also need the community to recognise the importance all these ‘non-profit’ organisations, groups and clubs make to the local economy and the ‘health’ of our whole community. Please help us to help you and the community grow over the coming years and we hope to see you on July 1st. 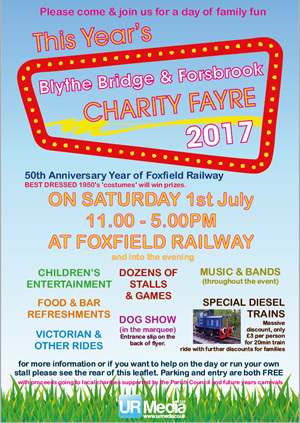 We would also like to thank Foxfield Railway for their help and support in running this years event. 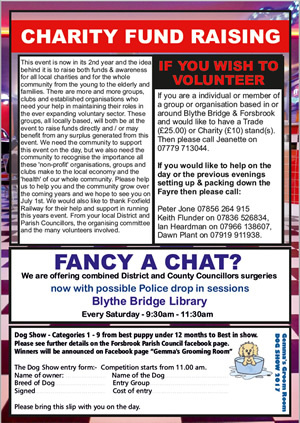 From your local District and Parish Councillors, the organising committee and the many volunteers involved. Tagged: blythe bridge, charity, fayre, forsbrook.